Let's have some me time! Since the kids are back at school, let’s have some “me time” and talk about a subject most commonly not discussed. Let’s talk leaks! I have noticed my body change since becoming a mother in more ways than I can count. Lately, I’ve noticed my hormones shifting, my hair changing and I find myself turning more and more into my mother every day. 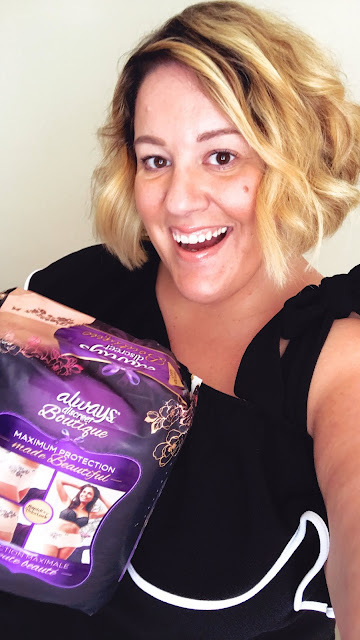 The women in my family have all experienced bladder leaks and I know my time is coming soon so when Always Discreet reached out to me, I was excited to learn more about their product and talk openly about the taboo subject of incontinence. I believe strongly that we must talk openly about our bodies because we aren’t the only ones going through changes. Afterall, there are more than 40 million American women of all ages experiencing bladder leaks! Not being open forces women to head to the pad aisle and reach for something that isn’t meant for the job. 1 in 6 women aren’t using the right products because pads are designed for periods, not bladder leaks. I learned that Always Discreet pads, liners and underwear are specifically are designed to absorb 2x more bladder leaks than a period pad. That’s amazing! And, Always Discreet has a line of products that feature exclusive technology including, a RapidDry™ core that absorbs leaks in seconds, Dual LeakGuards™ that help stop leaks where they happen most and OdorLock™ that neutralizes urine odors instantly. That is what I’m talking about - they know what they are doing! I want to know, what is your experience with bladder leaks? Have you tried Always Discreet? Let’s chat and if you want to learn more, go to www.alwaysdiscreet.com. Disclosure: This is a sponsored post presented by Always Discreet. All opinions are my own.